Magnum P.I. is a modern spin on the classic series starring Tom Selleck that originally aired between 1980 and 1988. The new version of the show was regarding as one of the big gets of the new season and features Jay Hernandez (Scandal) as its new Thomas Magnum in the title role. The character is a decorated former Navy SEAL who returns home and repurposes his military skills to become a private investigator. 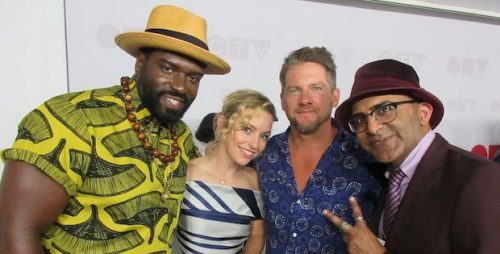 At CTV’s 2018 upfront presentation, I caught up with Magnum P.I.’s Stephen Hill, Perdita Weeks and Zachary Knighton. We chatted about the new remake of the series and how it will compare to the original. They opened up about how the show plans to modernize itself to the current time period but will still stick to the core concepts of each episode featuring a caper that needs to be solved. I talked to the cast about how reboots are especially popular currently and what the reason for this is. Finally the cast talked about what working with Jay Hernandez is like. Magnum P.I. premieres Monday September 24 at 9:00 p.m. on CTV.